Fancy the chance of winning cash prizes in return for a £1 a week stake? 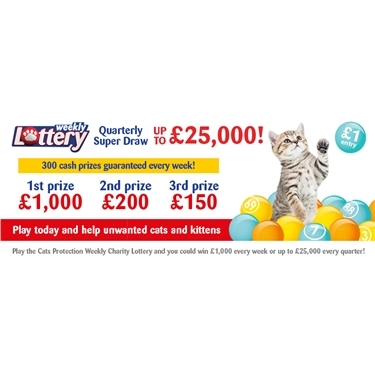 By joining the Cats Protection Lottery, and making us the Branch to receive your payment, every penny of your £1 will come to Rayleigh, Castle Point and District Branch and you will be entered into a draw to win one of 300 cash prizes awarded every week - including £1,000, £200, £150, £100 and £50. And, as a Weekly Lottery Player, you will also be entered into a quarterly £25,000 Super Draw Raffle. Imagine what you could do with that! So, for £4.34 a month, you could do so much to help the cats and kittens on this website and, hopefully, receive a lovely cash prize too. Please ring Lynda for more information on 01702 547557 for more information and a leaflet or come and see us at any of our events as listed on the Events page on the website. You can also sign up on-line via Charity Lottery – Join Cats Protection’s Weekly Charity Lottery Please select Rayleigh, Castle Point and District as your branch, so that all your donations come to us, and we will benefit from your subscription. And if you don't win? You will still be making a difference to a Branch that works so hard to help cats and kittens in this area.